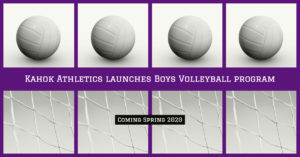 The Collinsville Community Unit School District #10 Board of Education approved the addition of Boys Volleyball to the athletic program at Collinsville High School beginning with the 2019-20 school year. Collinsville High School is the final school in the IHSA Southwestern Conference to have a Boys Volleyball team. “I’m very excited to offer Boys Volleyball to our student athletes at Collinsville High School. It is our goal to start the Boys Volleyball Program with a JV Team, and gradually increase our numbers to fill a Varsity Team and compete with the other member schools in the Southwestern Conference. This is another great opportunity we can offer the current and future students of Collinsville High School,” said CHS Athletic Director Clay Smith. O’Fallon and Granite City High Schools were the first schools to start Boys Volleyball in the 2007-2008 school year. The following year, Belleville West, Belleville East, East St. Louis and Edwardsville all added programs. In the 2011 school year, Boys Volleyball officially became a sport in the SWC without Collinsville and Alton High Schools. Alton High School started their Boys Volleyball Program in 2014 with only a JV team only and allowed for seniors to participate. In 2015, Alton formed a Varsity Boys Volleyball Team and joined SWC League. Since the required equipment is the same as Girls Volleyball, there is minimal expense to establish Boys Volleyball at CHS. A search is currently underway for a coach to lead the new program. Smith said a benefactor has offered to pay the cost of uniforms for the team. To follow the development of CHS Boys Volleyball, follow @KahokAthletics on social media or visit the Kahok Athletics website.